By Karl von Eckartshausen. In the tradition of tradition of Jacob Boehme, this is a “must-have” book for every earnest student of the Rosicrucian Philosophy, and a storehouse of priceless teachings of the Mysteries not available elsewhere. Eckartshausen (1752 –1803) a German Catholic mystic, philosopher, author and one-time member of Adam Weishaupt’s Illuminati, is best known for this important work on Christian mysticism. 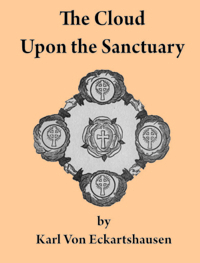 The Cloud Upon the Sanctuary was highly regarded by members of the Hermetic Order of the Golden Dawn, Arthur Edward Waite, and other prominent Rosicrucian organizations and individuals. In the tradition of tradition of Jacob Boehme, this is a “must-have” book for every earnest student of the Rosicrucian Philosophy, and a storehouse of priceless teachings of the Mysteries not available elsewhere.